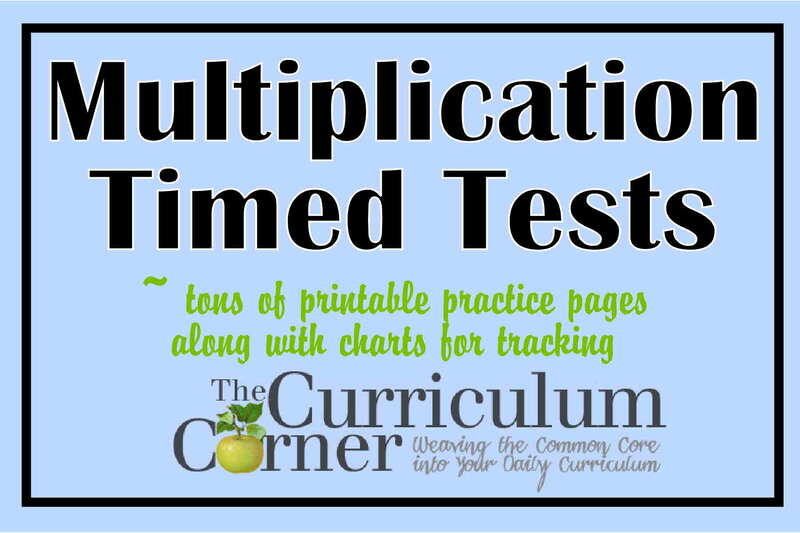 These free multiplication timed tests pages are grouped by facts. You will find 0s through 10s plus mixed facts practice and tracking pages. This is an older collection of free multiplication timed tests pages. It includes pages divided by facts along with mixed fact practice pages. We have also designed tracking pages and sticker charts. We have kept this set of timed tests available because we know that many of you like being able to grab just the page or pages you need as opposed to the larger download. We have created a new version that allows you to download the entire collection in one download. If you are interested in that collection, click on the bold, red link at the bottom of the post. If you prefer the individual downloads, they are still available here by clicking on the icons below. CC.ss.Math.Content.3.OA.C.7 Fluently multiply and divide within 100, using strategies such as the relationship between multiplication and division (e.g., knowing that 8 × 5 = 40, one knows 40 ÷ 5 = 8) or properties of operations. By the end of Grade 3, know from memory all products of two one-digit numbers. We like to include lots of engaging practice with our math fact mastery goals. Some of our favorites are Bump! games which you will find throughout our site along with other basic fact games. You will find many of our math fact practice games and read to go printables here: Basic Facts Activities. If you have additional ways you practice math fact mastery in your classroom, please share your ideas in the comments below so that other teachers may benefit from your ideas. How long do you give your students for the 25 multiplication problems? Hi Julia and thanks for your question. We have found that research supports 4 seconds per problem, so in our district we give students a minute and 40 seconds. (1 minute and 30 seconds in some classrooms.) We know that other districts opt for less time. Our sons are given 1 minute for 25 problems in the district we currently live in. Our suggestion would be to start with 4 seconds per problem to show mastery, but then push some students who may enjoy the challenge to complete the 25 problems in one minute. Thank you. I will give it a try. Love your website! would also like to print vertical problems in each of the number facts page. Thanks for the feed back on the time to give per problems!!!!! Love this site. Will put this on our “to do” list. (Actually it was already there.) We are pretty busy with back-to-school items and updating organizational and management resources, but hope to get to it soon! I like the format of your multiplication tests. Do you have a resource that goes up to 12s? Hi Kim! Not currently, but we will put it on our list of things to do! I’m currently trying to find strategies to get my students to learn multiplication facts. I want to do timed test, but I have a question. If the student does not finish the test, let’s say his 4’s, do he need to retake the test until he can master the time and number correct? Will this help the student by memorizing the facts and being ale to deliver them quickly? I’m curious to how others would do if the student doesn’t finish in time. Thanks. Hi Shatonya! Of course you need to do what you are comfortable with and what you feel is right for your students, but we have our students continue to take a specific test (say…the 4s) until they have mastered them with 100% accuracy and within the time limit. We feel it is important for students to know their facts, but also to be able to recall them quickly for future use with more difficult concepts. If the student doesn’t finish the test in the specified time, you can have him/her use a crayon to finish the rest so you will know which ones were completed in the timed portion. That way the student is still getting in a little extra practice with those facts. They will also be able to see their progress as they hopefully watch the number they got completed within the time limit grow each time they take the test. Hope this helps, but again…you will need to do what you feel works for you and your classroom. Thank you, thank you, thank you for these printables! I’m working with my 9 year old on these. He hasn’t quite mastered the timed drills yet. I’m trying to explain to him that knowing the times tables are so important for future math work. He’s been using an iPad app to help. Next, he’s going to watch School House Rock. Finally, we are going to have a race to see who can finish the most problems correctly! Do you have a printable Key for the timed Multiplication quizes? Thanks so much! I am so excited I found your site. Not currently, Karen, but we can work on that! These are the best, easiest to print sheets on the web! Thank you. Adding 11’s and 12’s would be a HUGE blessing!! Hi Ramu, The intent of these timed tests is not to help students to memorize their facts. We believe that there are various and personal ways for individual students to practice their facts in order to memorize them and let them serve as a foundational piece in their mastery of more difficult math concepts. These are meant to serve as an assessment and/or monitoring system (teacher and self) to determine who has these facts mastered. In our experience, it does motivate some students to learn their facts more quickly, but we wouldn’t want this to serve in a competitive nature in our classrooms. We always try to encourage students, give them feedback based on their levels, determine next steps, and help with practice and interventions based on the information the quick assessments provide. With regards to how other students react to those who don’t finish – since each student is working at his/her own pace (and are moving forward as they are ready), it is our experience that most of the time students don’t take much notice if others don’t finish because they may not know the levels that other students are working on. Of course it is also worth stating again, that this method may not work with all of your students and most certainly shouldn’t be implemented without the right kind of introduction. We have found that if we keep things positive and focus on helping students to understand why we are encouraging mastery (and more importantly giving them various ways to get these facts mastered), then these assessments can serve as a great tool for student self-monitoring and even motivation.